Fast Food Workers Need a Whopping Raise, and a Fighting Union! On September 5, Wyatt McMinn, vice president of Painters and Allied Trades (IUPAT) Local 10 in the Portland, OR-Vancouver, WA area and a longtime fighter for the cause of workers’ rights and oppressed people, was arrested and charged with first-degree trespassing. 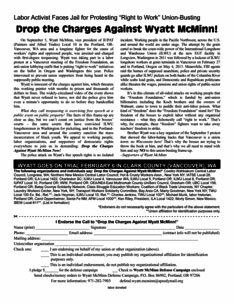 Wyatt was taking part in a labor protest at a Vancouver meeting of the Freedom Foundation, an anti-union lobbying outfit that is putting “right to work” initiatives on the ballot in Oregon and Washington this year. Police intervened to prevent union supporters from being heard in the supposedly public meeting. Wyatt is innocent of the charges against him, which threaten this working painter with months in prison and thousands of dollars in fines. The widely-circulated video of the event shows that Wyatt never refused to leave, nor did the police give him even a minute’s opportunity to do so before they handcuffed him. 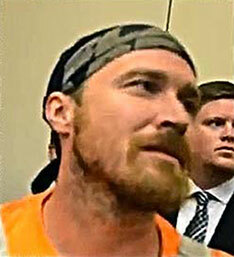 What they call trespassing is exercising free speech at a public event on public property! The facts of this frame-up are clear as day, but we can’t count on justice from the bosses’ courts – the same courts that have convicted International Longshore and Warehouse Union (ILWU) longshoremen in Washington for picketing, and in the Portland-Vancouver area and around the country sanction the mass incarceration of black youth. 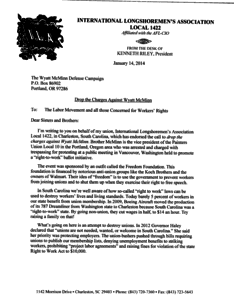 We appeal to working people, labor organizations, and supporters of democratic rights everywhere to join us in demanding: Drop the Charges Against Wyatt McMinn Now! The police attack on Wyatt’s free speech rights is no isolated incident. Working people in the Pacific Northwest, across the U.S. and around the world are under siege. The attempt by the grain cartel to break the coast-wide power of the ILWU at the new EGT facility in Longview, Washington in 2011 was followed by a lockout of ILWU longshore workers at grain terminals in Vancouver on February 27 and in Portland, Oregon on May 4, 2013. Meanwhile, FBI agents raid the homes of supposed anarchists, police and private security guards go after ILWU pickets on both banks of the Columbia River while scabs load grain, and Democratic and Republican politicians alike threaten the wages, pensions and union rights of public-sector workers. It’s in this climate of all-sided attacks on working people that the “Freedom Foundation,” which is funded by anti-union billionaires including the Koch brothers and the owners of Walmart, came to town to peddle their anti-labor poison. What kind of “freedom” does the “Freedom Foundation” stand for? The freedom of the bosses to exploit labor without any organized resistance – what they dishonestly call “right to work.” That’s why, for example, these “freedom” fighters want to take away teachers’ freedom to strike. Brother Wyatt was a key organizer of the September 5 protest that showed the labor-hating hacks that Vancouver is a union town: no Wisconsins here! That’s why the bosses are trying to throw the book at him, and that’s why we all need to stand with him and say NO to this union-busting frame-up. 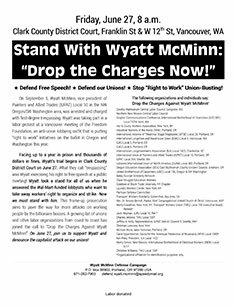 Add your name to the call to “Drop the Charges Against Wyatt McMinn” by filling out and mailing this form. Ken Riley, president of International Longshoremen’s Association (ILA) Local 1422, says “‘Right-to-work’ is a fraud. It’s really an attempt to destroy workers’ right to organize.... I say to you from our experience in South Carolina: fight back now before this cancer spreads further.”. Read the full letter of endorsement here. The following organizations and individuals say: Drop the Charges Against Wyatt McMinn! *Union affiliation for identification purposes only.